Men and women who like Pac-Man are gone love this t-shirt. On this t-shirt you can see a typical sign we all know with a character throwing garbage in the bin. But this time the man has the face of Pac-Man and he is trowing a ghost in the garbage. We showed you the black version of the shirt on with the yellow print really comes to life but you can get this t-shirt in all kind of colors. As said before the Pac-Man garbage t-shirt comes in a men and women’s version and there is even a tank top and sweatshirt version available. 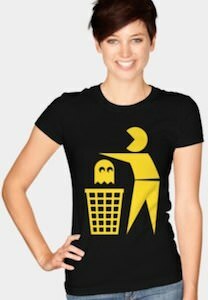 Tell the world to dispose their garbage the right way by wearing this Tidyman T-Shirt.